Asst. Prof. Sarah London has long appreciated zebra finches for their unique learning characteristics. The males learn from another male tutor, but their ability to memorize the tutor's song is restricted to a "critical period," or CP. This offers a unique opportunity to study how the brain learns, and how brain processes affect whether or not a mentor's song can be learned, London said. Previous research has shown that males who had experienced a tutor in their first 65 days of post-hatch life could no longer learn a song after that, but that young males isolated from hearing song during this period were still able to learn a song after day 65. What researchers hadn't deciphered until now was what preserved or prevented these late learning capabilities. In a new study, London's team found the first comprehensive explanation for this in an epigenetic mechanism, a process in the brain by which experience—in this case, tutor experience—can modify structural properties of the genomic DNA. London and her team demonstrate measurable and repeatable epigenetic differences between the brains of zebra finches who receive tutoring, and those that do not. These epigenetic differences directly relate to levels and patterns of gene expression in the brains of finches that can still learn from a tutor compared to those that can no longer learn song. London believes the results of this study could have future implications for helping trauma patients to prevent encoding those events into their long-term memory, as well as advancing our understanding of how young children learn, and what can be done to enhance learning capabilities among disadvantaged youth in order to level the playing field of learning among children entering school. "These results help us understand complex genomes in the context of the everyday learning experience," London said. "It decouples the actual experience from the genomic process happening in the brain, and this knowledge could be a guide to therapeutics." 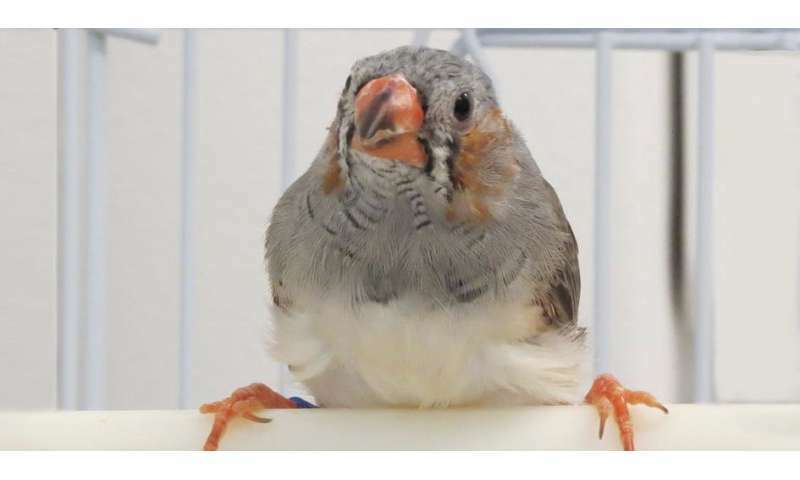 The primary goal of London's lab is to identify the neural properties that promote and limit the ability to learn, and she emphasizes research on zebra finch neural development and learning behaviors to identify these traits. The team took advantage of the natural CP for mentored song learning to test the hypothesis that tutor experience within the CP alters mechanisms in the brain that control genome function. They hypothesized that this would explain how the tutor experience ends the CP for learning, while isolation from song during the CP extends the age at which juveniles can memorize tutor song. In the study, coauthored with Somayeh Ahmadiantehrani, a postdoctoral fellow at UChicago; and with Theresa K. Kelly and Adam Blattler from Active Motif, Asst. Prof. London and her team isolated one set of male juvenile finches from male tutors during the CP of song learning, which occurs between 30 and 65 days post-hatch. A second group of juveniles did experience a tutor during the CP. After day 65, London's team analyzed the brains of both groups of finches to compare epigenetic landscapes, patterns of gene expression and cellular properties of the brain between males who experienced a tutor and those who had not. The results show that learning a tutor song induces specific epigenetic changes that do not occur in the brains of the isolated males, and vice versa. Among the findings was the fact that regulatory factors well-studied for their role in learning and memory in juvenile zebra finches and other animals, such as the extracellular-signal-regulated kinase (ERK) pathway, are overrepresented in the set of genes predicted to be more highly expressed in the isolated birds. Because gene expression triggered by experience is necessary for learning and memory, these findings raise the possibility that the gene expression required for tutor song memorization is mechanistically linked to epigenetic processes that control the ability for subsequent tutor experience to trigger gene expression, thus preventing future tutor song memorization after day 65. The tiny songbirds have proven invaluable to London's research into how animals learn. "Developmental song learning in zebra finches is one of the most striking examples of a CP for complex learned behavior," she said. "The learning experience has a profound and long-lasting effect on their neurological cognitive processes."